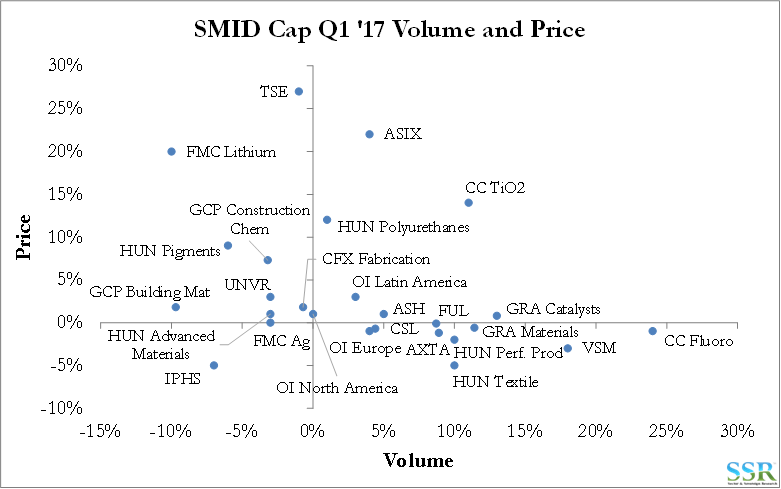 SSR LLC – SMID Cap Industrials & Materials – What Have We Learned So Far This Year? We have highlighted the Q1 results for our general large cap Industrials & Materials and Chemicals specific universes as being the best quarter versus consensus expectations since 2011. 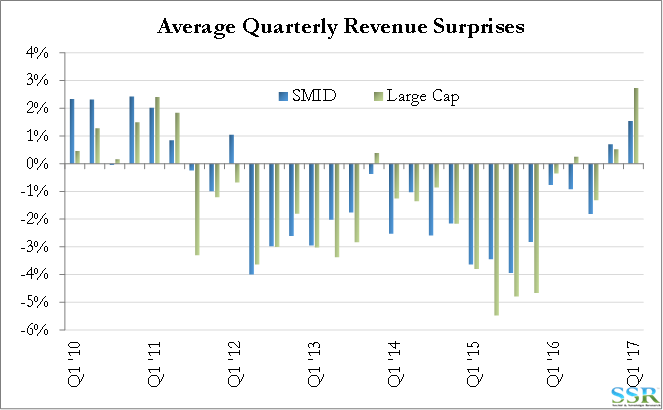 Our SMID cap group shows a similar pattern but less significantly so – Exhibit 2. The gap is possibly explained by a larger non-US exposure in the large cap group and relative strength in those non-US markets. Strong volume growth in China and other parts of Asia – primarily driven by strong consumer growth. Within China, despite some more stimulus this year, industrial growth is weak. Strong industrial and consumer growth in India. Europe bouncing off a very low bottom – so showing much better year/year comps – note that Q1 2016 was a low point for many industries in many regions, as oil collapsed and drove down pricing and volumes. Penalizing the US in Q1 2017 – very weak GDP. While we have focused on the strength of the dollar since the election – the Q1 year/year difference was not significant. Exhibit 3 shows the individual company results behind the SMID data in Exhibit 2 above. 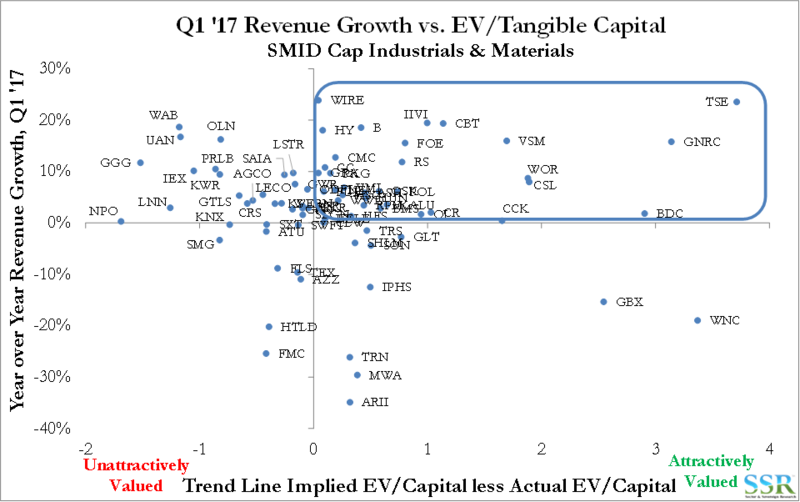 Commodity stocks are notable outliers in the top right quadrant of the plot, indicating revenue and EPS results that came in above consensus – TSE, WLK, CC, and HUN. The other major outliers provide some interesting insight into increased economic activity in Q1. BGC (General Cable Corp – copper wires and cables), CMC (Commercial Metals – steel recycling/fabrication) and HY (Hyster-Yale – lift trucks) all signaled strength in infrastructure/construction/manufacturing. ATI (Allegheny Technologies – metal alloys and steel products) would also fit in this category. 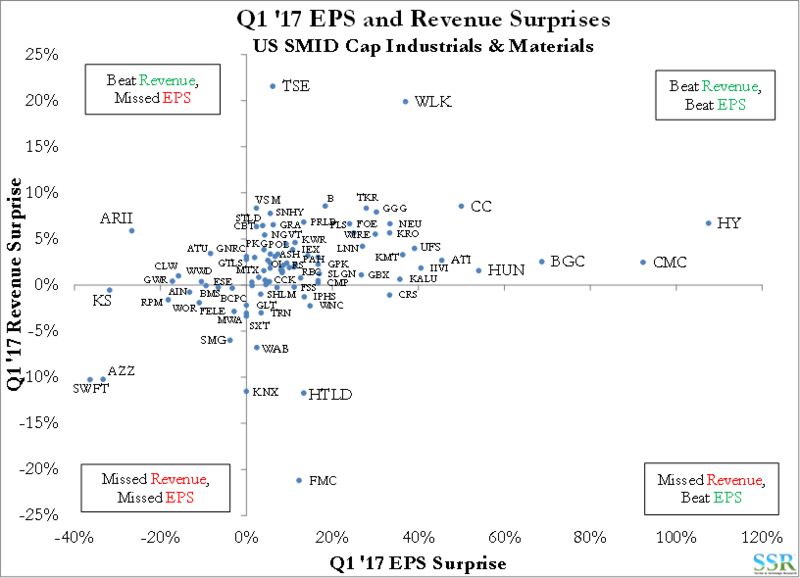 Operating leverage is high for all of these stocks, evidenced by EPS surprises several multiples above the respective revenue surprises. Operating leverage is very high for most companies on the list, with very few suffering from capacity shortages and with minimal cost associated with increasing sales volumes. Exhibit 4 plots return on tangible capital against an enterprise value multiple of the tangible capital base – stocks below the line suggest relative upside, stocks above the line suggest relative downside. 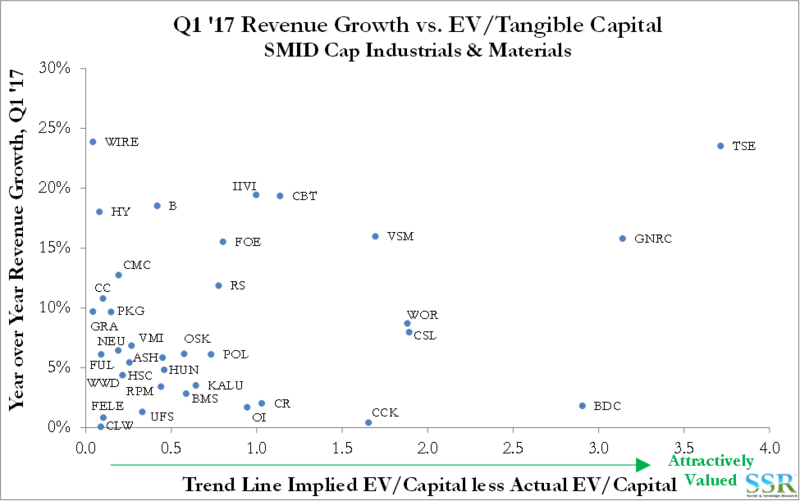 We have applied this valuation work to the SMID space in the past as a guide in the absence of sufficient historical data for many of these companies to utilize our mean-reverting, return on capital trend-based normal valuation models. 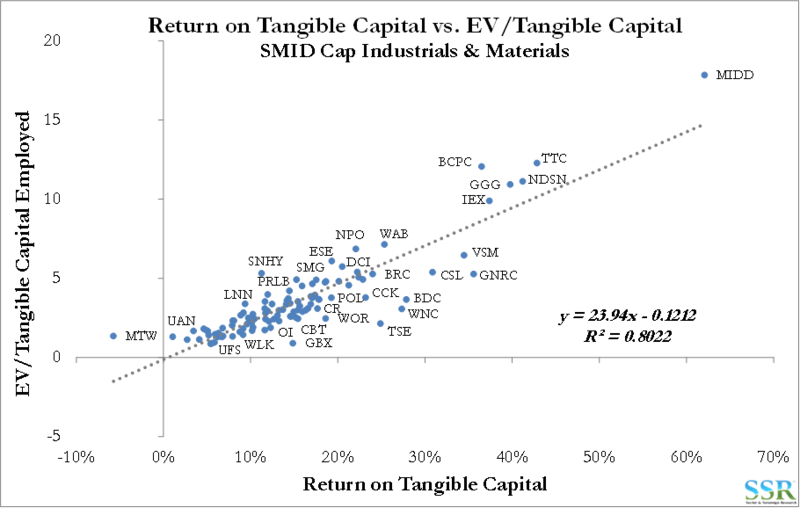 If we compare a company’s actual EV/tangible capital ratio to the value implied by the line of best fit, we can get to a rough standardized gauge of attractive/unattractive valuations. In Exhibit 5 we plot this valuation measure against year over year revenue growth in Q1 ’17. We would be focused on the top right quadrant of this plot – attractively valued stocks showing revenue growth. Exhibit 6 zooms in on this quadrant for a closer look at the companies. There are a number of companies in this quadrant that we have done more detailed work on and for which we have a positive bias, TSE, VSM, GNRC and HUN. Others in this quadrant clearly warrant further work. There are very few obvious short ideas from this analysis, with FMC trading on the promise of what the deal with DuPont will bring, which is likely substantial, and SMG likely getting some seasonal benefit of the doubt as wall and interest in its new hydroponics business. There are unattractively valued companies with good revenue growth that may have got ahead of themselves in 2017 and may take a pause. UAN is a space that has a good longer-term outlook but is likely in for a disappointing 2017 – we would expect UAN and competitors like CF to, at best, mark-time in 2017, but possible provide a better entry point later. In Exhibit 7 we list all the companies in Exhibit 6 and show their end market exposure at a very high level. We also show their exposure to the US as a proportion of total sales. Earlier in the year, when there was an expectation that the Trump administration might do something to stimulate US economic growth we suggested a focus on companies with a greater proportion of sales in the US. This stimulus is looking less and less likely every day, given the evident lack of focus in Washington and we see exposure to the US as less of a driver today. However, while parts of Asia may be growing well, and Europe, post the French election looks marginally more stable, we now have more concerns about South America, with the risk of further political unrest in Brazil. At a high level this would be another blow for the Ag industry, with Deere’s recent celebration of better demand in Brazil possibly short lived if we see a further loss of confidence in the country – in the SMID space this is negative for AGCO and for the fertilizer producers. The group in Exhibit 7 have a bias towards the consumer economy over the industrial economy – which makes sense given generally depressed Industrial Production and generally better consumer spending globally.